Did You Know This Hotel Has The Longest Breakfast Buffet That Starts At 4AM? 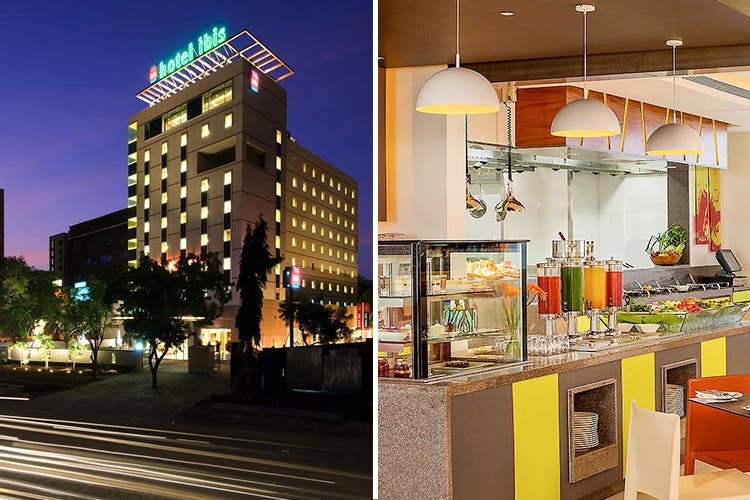 ibis Pune is a swanky 3-star business and leisure hotel, ideal for a one-day business trip as well as a quick getaway with friends. The hotel is located on Survey No 32 in Nagar Road, next to Dominos Pizza. ibis Pune is one of the few hotels in Pune which while economical, spoils you like a baby with its many facilities. The hotel boasts of 160 contemporary, soundproof rooms with state-of-the-art architecture, all decorated artistically with modern amenities. The best part is that all rooms come with high-tech mattresses that de-stress the body. The rates at ibis Pune start at INR 4,500 and vary according to the type of suite. Additionally, the hotel hosts an extensive breakfast spread which is, by the way, the biggest in Pune, from 4.00 am to 12.00 pm (noon). Cold breakfast is available from 4.00 am until 6.30 am after which buffet breakfast starts and goes on until 10.30 am. Cold breakfast resumes again and goes till noon. We especially recommend you to try their Continental spread which is absolutely smashing. The hotel comprises of three meeting rooms which makes it ideal for hosting business meetings and parties. Spend a weekend at Ibis with friends or host a business meeting without drilling a hole in your pocket.